Not all apps are created equal. Some can be quite dangerous and lead to unintended consequences. 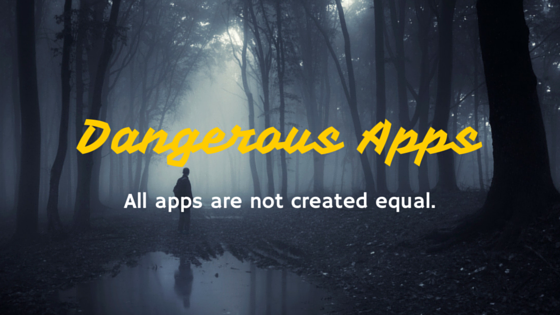 Let’s take a look at some dangerous apps that parents should know about. These may not always be used with best intentions. According to their site, the YikYak app was created as a way to “get a live feed of what everyone around you is saying”. YikYak creates an anonymous chat room based on your location where anyone with the free app can post comments or thoughts. Imagine Twitter but specific to a geographical location. While the idea sounds great, YikYak has become a major problem across the nation, especially for universities where the app is most popular. The issue comes in with the anonymous aspect of YikYak. Since YikYak does not require a username or email, some users have taken that anonymity to post racial remarks, sexually harassing comments, or even threatening violence. In order to take action, the police have to have a court order for YikYak to reveal the source of the comments. It’s a real mess at time. To be clear, not every comment on YikYak is bad. Unfortunately, the real purpose of the app is lost in the reckless words of cowards. Another popular app among the 15-30 yr old demographic is Snapchat. Snapchat let’s users send pictures or short videos called “snaps” to any one their friends list. The picture usually have a small banner of text toward the bottom that includes a short message. Essentially, these are text messages on top of a picture. The difference between Snapchat and a traditional text message is that snaps automatically disappear a few seconds after have been seen. The promise of automatic deletion has made some users more inclined to send racy or inappropriate pictures. No one else will see it cause its deleted, right? Not so fast. Anyone who receives these sorts of photos can press a few buttons on their phone to make their own copy of the photo that they can keep, show their friends, post online, etc. See where this is headed? The person who sent the photo is notified that a copy was made, but there are other apps out there like “Snaphack” that will make a copy without the other person knowing. The majority of Snaps are the kind of random things you would text to your friends at any age. I want to be very clear that Snapchat is not a bad app when used appropriately. If your child is using it (they probably are), it merely warrants a conversation about how to use it in a smart, safe manner. Apps like this are used to take a picture without anyone knowing that you’re taking a picture. Essentially, it turns your phone into a hidden camera. Some common features of these apps include muting the sound so the phone doesn’t make a “shutter” sound, sensors to take a picture or video when motion is detected, or disguising the camera preview window to look like a web browser. The intent is to capture pictures without the subject’s knowledge. There could be a valid reason for using one of these apps (like trying to catch a thief), but there are also much more sinister uses for hidden camera apps like this. Got a private photo you don’t want anyone else to know you have? Enter vault apps. These sorts of apps are at the center of controversy at a High School in Colorado. A vault app hides designated photos on your phone from prying eyes. While they seem simple enough, these are very sophisticated apps. Some look like a standard calculator apps. When you type the right set of number as a pass code though, the app opens up to reveal your photos. Others even include a “dummy” pass code. It works like this. Someone wants to see the photos in your vault so you enter a dummy pass code that opens a set of “safe” photos, keeping the real stash private. Vault apps work hand in hand with Snapchat or hidden camera apps. Once an inappropriate is received image through Snapchat or a hidden camera app, a vault app can be used to hide it from prying eyes. Self described as the app that “let’s you talk to strangers”, Omegle does just that. When you load up the app, it creates a one on one video chat room connecting you to random people all over the world. The random connections often pair you up with a random man doing inappropriate things on camera. While researching the app for this story, I used the app to be randomly connected to ten people. Out of those ten, three were inappropriate men in various states of undress. This is not a good app for young, impressionable people (or for anyone else for that matter). There are two things that parents can do to help deal with apps like this in a world where technology is constantly changing. The first thing is to have an honest discussion with your children about the dangers these apps pose. Whether it be sending an inappropriate image or simply possessing one, there are some real world consequences for both. Use this an an opportunity to have that conversation and educate them. Secondly, parents can enable parental controls on both iPhones and Android devices. From the iPhone side, parents can choose to approve every app that a child wants to download. For example, the “Ask to Buy” feature on iPhones will send a notification to the parent’s phone looking for parental approval before the app can be downloaded. Android doesn’t have that feature, but it does have parental controls that can help lock the devices down.